I went to two very different museums today – very different in that they had different content and themes, obviously, but also different in that one was western and modern and ruthlessly contemporary and the other was in an east that had not been updated at all. Perhaps no one’s told them about that wall. This is a picture of the outdoor installation of the second museum, The Topography of Terror, which makes it sound a bit of a funfair ride. I can assure you it is not. But first up was the State Museum of Childhood and Youth. The first challenge was to find it. Having consulted a variety of maps and walking the same two blocks back and forth, I found it. On the top floor of a block of flats, perhaps? There was no signage whatsoever. I did feel like I was breaking and entering, but there didn’t seem much to take. Then I could hear the shouting of small children. This might have put another traveller off, but I was promised Nazi and DDR classrooms from a guidebook. Push on, push on! At the top of four flights of stairs was a clump of thirty amazingly well-behaved German children, spending their Euros on children’s toys from yesteryear: wooden tops with sticks and strings, coloured feathers. The prices were not from yesteryear, however – really, one Euro for a coloured feather? I think the children felt they had to buy something, to be polite. They were exceedingly polite. The white-haired woman serving them raised her eyebrows at me, gave a shrug. Yes, I would wait my turn to enter – this was the children’s museum after all. I had a half-chat with another woman with carefully drawn on eyebrows who found it odd I should be wearing flip flops. I suppose it is odd, now that Oktoberfest is beginning below my window. I didn’t know the German for “feet hurt” and I thought that sharing the big phrase I can remember, “Ich habe grosse kopfschmerzen” wouldn’t leave her any the wiser. She took my coat and bag. My bag is simply too big for Germany. So I stripped down to “museum mode” with essentials: passports, camera, iPhone, notebook, pen. (Honestly, if I decide to research in the wild, I will be the first to be knocked down and eaten due to excess luggage.) The white-haired woman was ready for me now; she took my 2 Euros and all my excess baggage, shrugging again and pointing at a locker. Clearly I did look like I was up to no good. I kept the notebook stuffed in my pants – I do have my priorities – but I didn’t write anything down after all, nor did I long for my absent camera. There were 4 rooms with vague artifacts of childhoods from 1900 to 1970-something. There was not a lot of labeling and what there was defeated my high school German. It felt like a museum from my own childhood, actually – from anyone’s old childhood spent visiting dubious museums celebrating pencils or the world’s biggest thermometer. (You can actually visit those sites in California. I digress.) I gazed about each of the rooms with the politeness of a German child, then retrieved my belongings. Eyebrow Lady told me I was quick. I shrugged. I left without a feather. I rocked up to the Topography of Terror (hold on tight!) expecting very little. Perhaps it is the low-key entries in guidebooks. Perhaps it is the faintly ridiculous name for an exhibition on the filled-in ruins of SS buildings. But I was completely unprepared. 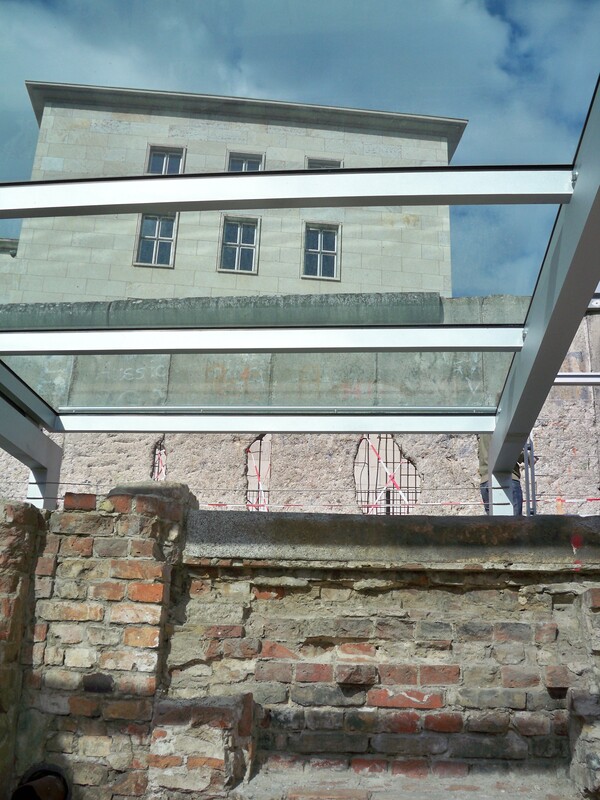 The picture above shows the foundations of one such SS building, with the former Reich Aviation Ministry in the distance, now the Federal Ministry of Finance, and a long stretch of the Wall between. Behind are gravel tracks and small plaques indicating what lies beneath. People read slowly and carefully. Inside the Documentation Centre, which leads me to believe it will be a place to collect flyers and have a wee, is an exquisitely detailed exhibition of the history of National Socialism, from Hitler’s Chancellory to the post-war trials. Several young Germans give tours to dazed visitors, but my ears cannot keep up. I must be content to read, and read, and read. Maybe the guidebooks think people won’t come if they know what’s here. Frankly, I was impressed and overwhelmed by the amount of information on offer: police transcripts, arrest files, newspaper articles, photographs more graphic than I have ever seen – and I’ve seen a lot. I bought a piece of spinach quiche and couldn’t eat much of it. When the clerk followed me back into the exhibit to ask if there was something wrong with it, I said no, no, of course not, “zu gross” etc. and then burst into tears as he left. Warum? His random kindness and concern, his small pink hearing aids, or the fact that we were having this little exchange before a line of black and white men swinging from hooks? I thought that the Germans wouldn’t want to talk about the war. I remember when a young German offender, years ago, asked me why people still cared about “that war – it was so long ago – we have moved on.” I was prepared for coyness about the Nazi years. I was struck by the even handling of the facts and figures at the History Museum yesterday, but here is full-throttle, in-yer-face reckoning in this stark stone and glass box. Not only are Germans looking history in the face, they are staring it down, staring into the dark centre of its eye, refusing to blink. There is something incredibly moving just in that – that ability, that willingness to look. Just to look. Lest you think I’ve gone all serious, I will continue to be as glib about Nazism as I can be. That’s where my character is, at least until the bitter end. It’s how they all were, I suppose, until the bitter end, those who had not been taken, of course. Those who passed their tests. Here is my favourite photo from the exhibit. I didn’t take many. Here is a Nazi couple, catching a few rays. This is where my character is, for a little while, at least. Gosh, it sounds as if it was very emotional, that second place. Your descriptions had me hooked. It’s a fascinating, strange, harrowing time and place to be researching. I’m sure it will stay with you, which is the point. Can’t wait to read the book and feel those characters and places that are seeping into your imagination come alive…thanks for sharing. Very moving and emotional; it had me enthralled. I admire your commitment to your research; I am sure you can feel the characters come alive. A very tough place to go, but important that it is there for people to see.